This session the record is 7-1. Since October of 2011, the record is 28 wins and 4 losses. That is a record that any team would be proud of and evidence of a significant amount of work and effort to improve its performance on the court. However, I am not talking about any particular basketball team currently involved in March Madness and the upcoming NCAA Men’s Basketball tourney. I am talking about the record a team called The United States Chamber of Commerce has in cases it has argued or filed a brief in front of the Supreme Court. Even Coach K or Coach Izzo would be jealous of that record. I guess I should not be surprised at how successful the Chamber has been in cases in front of the Supreme Court, but I am old enough to remember that the Chamber of Commerce and other business entities and interests did not always have such astounding records in front of the Supreme Court. The Rehnquist Court decided in favor of US Chamber of Commerce cases only 56% of the time while the Roberts Court is currently favoring the Chamber of Commerce at a 72% rate. The Constitutional Accountability Center also tells us that the Burger Court found in favor of the Chamber of Commerce only 43% of the time. What could cause this impressive winning percentage for the Chamber of Commerce in cases it has argued or filed an amicus brief? Could it be politics creeping into the decision making process of the Justices? Does the Chamber have an overwhelmingly better legal staff than many of its opponents in these cases? 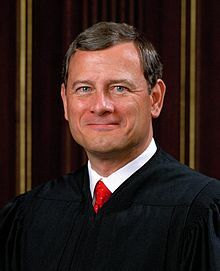 If the Roberts Court continues to favor Chamber cases at its current rate of 72% or its 88% success rate since 2011, could the success rate itself be a deterrent to people attempting to have their cases heard in the top court of the land? The current term of the Supreme Court still has 6 cases to be decided where the Chamber of Commerce is involved. When one reads of these heady success rates by the Chamber of Commerce, it should make people understand why nominations by Presidents to the Supreme Court are so important. It could also be argued that Chamber success rates that have been climbing in recent years is another reason why the Right has so frequently filibustered Judicial appointments of the Obama Administration. A pessimist could claim that Chamber money could keep flowing to Conservative candidates in order to maintain these lofty win/loss records. Can individuals who are in litigation with Chamber backed opponents have any confidence that they have a legitimate chance of success if the case goes all the way to the Supreme Court? I guess at the end of this term, when the remaining 6 cases have been decided, we will either have additional evidence that the Chamber has a firm grip on the Supreme Court or evidence that the Supreme Court has softened its pro-Chamber proclivities. Do you think the Chamber will maintain its Hall of Fame winning percentage? What can be done to insure that no one organization or group or individual has a lock on the Supreme Court? How much evidence need surface before some whistleblower manages to blow the whistle on the intrinsic and inescapable deception that is inescapably an essential feature of any form of law in adversarial form? Sooner, if not later, the adversarial nature of the inherently tragic and inescapable deception of adversarial law will become the greatest adversary of adversarial law? Only after people wake up enough to grasp how adversarial law is adverse to life itself, and adverse to everything else, will a way to structure law and law enforcement in accord with biologically real human life? Adversarial law, as is true for any form of escalating reciprocal retaliation process, is ineluctably self-defeating and self-destroying. So much for lifetime appointments to the bench. How many more decades will this chief justice be with us? Apparently more years than we have liberties left to spare. The crypto-fascists aren’t afraid of light anymore, they operate in broad daylight for those who care to see. Money can’t buy a personality that people will like either. Money can’t keep people from seeing through toxicity and hatefulness. The truth can’t be bought, it always comes to the surface, either sooner or later. One must merely be patient. Money can’t buy your sanity, or just common sense. The Wall Street Journal trotted out well-worn myths, many provided by the conservative lobbying group the U.S. Chamber of Commerce, to complain about the latest attack on class action lawsuits currently in front of the Supreme Court. On March 5, the Supreme Court heard oral arguments in Halliburton v. Erica P. John Fund, a case that could make it more difficult for a class of shareholder plaintiffs to file lawsuits against corporations who commit fraud. At issue in this case is the “fraud on the market” theory, which was established by the Court in a 1988 case called Basic v. Levinson. The fraud on the market theory unremarkably assumes that a company’s stock price reflects the information publicly available about that company — including any false statements made by the CEO or other corporate officer. The fraud on the market theory allows plaintiffs to form a class action and sue based on that fraud, which have artificially inflated the stock price. The WSJ, for its part, would like the Court to overturn Basic and get rid of this highly effective method of protecting everyday Americans from corporate fraud. In a March 6 editorial, the paper essentially repeated all of the Chamber’s talking points it presented at its February 28 event dedicated to the Halliburton lawsuit, including the idea that the only beneficiaries of securities litigation are plaintiffs lawyers, and that these class actions unfairly punish shareholders. geez guys can you use sources others than those supported by unions or George Soros? Do you have some unbiases sources for us to look at? In a “Pay to Play” system, who represents those that are poor who can’t afford to bribe government officials? The Koch brothers and the John Birch Society. Two peas in a pod.